This "utility stainless steel" is a proprietary modification of Grade 409 12% chromium stainless steel. It has been developed as a readily fabricated, low cost grade, exhibiting good resistance to wet abrasion and mildly corrosive environments; the titanium stabilised composition results in excellent resistance to sensitisation in welding, particularly of thin sections. There are no national specifications or international specifications covering this grade. The designation "AtlasCR12Ti" is a registered trade mark of Atlas Steels. AtlasCR12Ti is effective in many applications where carbon steel, galvanised, aluminised or painted steel or aluminium give unsatisfactory life. It is not attacked by strong alkalies, and often gives adequate resistance in mildly acidic conditions. Light surface rust can form in many atmospheres, making the material unsuitable for decorative applications. AtlasCR12Ti strongly resists chloride stress corrosion cracking, but is less resistant than 304 or 430 to pitting and crevice corrosion in chloride environments. AtlasCR12Ti is likely to resist pitting in water with chloride contents of up to 100 to 200 mg/L at ambient temperatures. The presence of sulphate or nitrate ions will reduce the corrosivity of chlorides. AtlasCR12Ti is titanium stabilised to be more resistant to sensitisation and intergranular corrosion compared to alternative grades such as AtlasCR12 (1.4003). Consult Atlas Technical Assistance for specific environmental recommendations. In air AtlasCR12Ti offers scaling resistance to 620°C continuous or 730°C intermittent, but if under stress the temperature should be limited to 450°C continuous or 600°C intermittent. AtlasCR12Ti suffers negligible embrittlement after extended exposure at temperatures of 450-550°C. Annealing - heat to 700-750°C, soak for 1½ hours per 25mm section. Air cool. The maximum temperature of 750°C should not be exceeded. Annealing should usually be followed by pickling and passivating. This grade should not be hardened by heat treatment; quenching treatments may reduce the corrosion resistance and mechanical properties. AtlasCR12Ti is resistant to the sensitisation and intergranular corrosion that can occur in welding of unstabilised stainless steels. It can be welded using similar techniques to austenitic stainless steels. Low heat input processes are preferred - particularly GTAW (TIG) and GMAW (MIG). Filler wire recommended is grade 309L; this over-alloyed grade is important for welding AtlasCR12Ti to other steels, but 316L and 308L have also been successfully used when welding AtlasCR12Ti to itself. Heat inputs should be controlled to 0.5 to 1.5kJ/mm. Argon plus 1-2% oxygen shielding gases are recommended. Discolouration of the weld should be removed by pickling, except possibly in wear applications; effective purging and use of backing gases is often a better option. 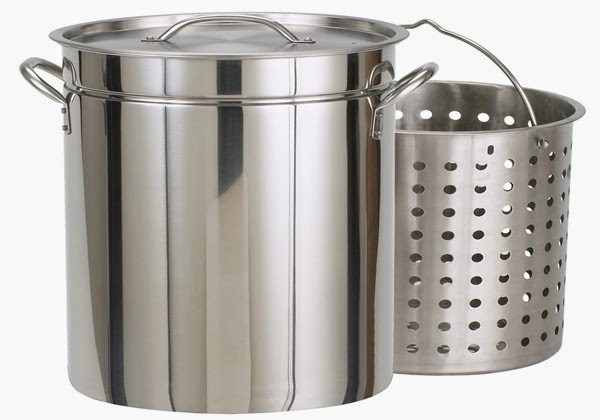 Standard stainless steel pickling pastes can cause higher attack than they do on austenitic grades; these should be used with caution. 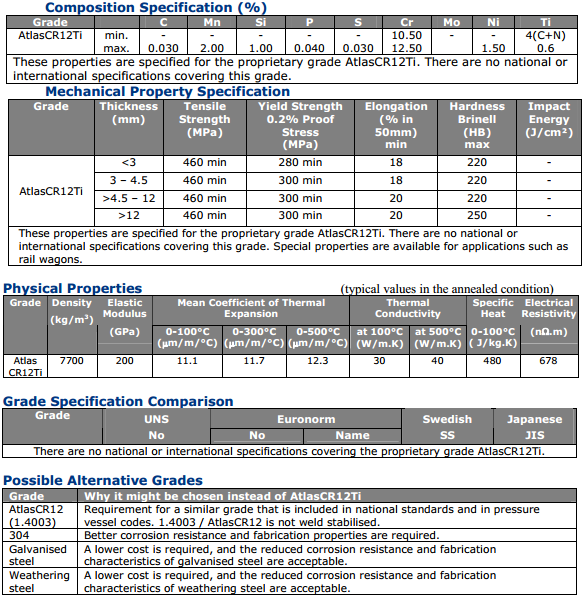 AtlasCR12Ti has a machinability similar to that of grade 430, ie about 60% of that of mild steel. The work hardening rate is lower than that of austenitic stainless steels, so reducing the need for special machining techniques. AtlasCR12Ti is available in standard No1 (“HRAP” – Hot Rolled Annealed and Pickled) finish in sheet, plate and coil down to 3mm thickness, and as cold rolled 2B finish in lighter gauges. Mining and mineral processing and transport equipment. Rail wagons for coal and iron ore. Sugar processing equipment. Furnace and oven parts. These properties are specified for flat rolled product (plate, sheet and coil). Similar but not necessarily identical properties apply to other products such as pipe and bar, but this grade is almost exclusively a flat rolled product.